Backed by our team of experienced professionals, we are engaged in manufacturing, trading and supplying a wide assortment of Block Board. This block board has 40% greater mechanical strength as compared to any other phenol bonded block board. Our offered boards are ideal for the structures that are exposed to relatively higher humid environment. Furthermore, these can easily availed from us at market leading prices. Regency block board is manufactured with selected and seasoned planks. The planks are treated with preservatives of special quality to resist borer, termite and fungi attack and later kiln dried at an technically laid temperature schedule. Regency's drying technology and temperature control parameters are tough to maintain elsewhere and rare in the industry but it superbly helps in getting balanced and straight planks. With a high MOE and MOR factor, Regency boards are highly suitable for Indian houses. 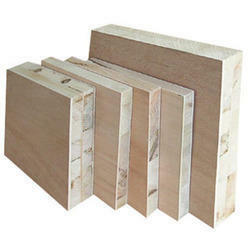 Backed ourselves with sound amenities and talented personnel, we have emerged as the leading manufacturer and supplier of superior quality Block Board. Our offered board is used for cabinets, almirah, door partitions and shelf. For designing this board, our proficient professionals use premium quality raw material and modern technology in line with industry norms. Moreover, provided board is available for our customers at market leading prices. Looking for Block Board ?